BSNL has announced the launch of an exciting Social Media Contest #BSNLOntheGO exclusive for its Customers in all the circles. As per the latest information, all existing and new BSNL customers can participate in the Social Media Contest by sending a short film highlighting the positive moments of BSNL Services. The maximum length of video should be of 5 minutes duration. The contest is open from 17-05-2017 for a period up to 15-06-2017. 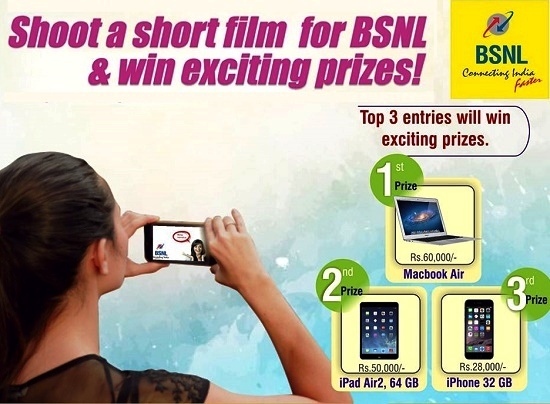 3.The entries will be in form of a video on BSNL (maximum of 5 minutes duration). 4.The entries should be submitted on BSNL Social Media platform i.e., Facebook or Twitter. 5.Only One entry is permitted per customer. Multiple entries by the same customer will not be considered. 6.It is compulsory to use #BSNLOntheGO while submitting the entries on Twitter. 7.Each entry should be submitted along with a proof of being BSNL Customer. 8.Entries submitted will be sole property of BSNL and may be used for any future promotion. 9.Decision of BSNL management in selection of winners will be final. 10.All BSNL Employees and their relative / friends cannot participate in the contest. 11.Entries will be accepted from 17-05-2017 up to 15-06-2017. Current time: 04-25-2019, 09:37 PM Powered By MyBB, © 2002-2019 MyBB Group.